Garage Door sales, service and installation. Unfortunately, nothing lasts forever and garage doors are no exception. Even the best and newest garage door can break unexpectedly. You go out to your garage and your door does not open, or does not open properly. Competition Doors has over 30 years of experiencing installing and repairing garage doors. Local family owned business. 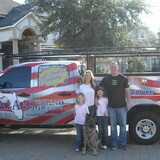 Providing quality garage doors and repairs to the Jacksonville area for the past 15 years. Fleming Island garage door contractor that offers affordable garage door services. Delivers garage door opener keypad installation, solutions to automatic garage door openers located in Florida. St Augustine garage door company renders the best kinds of carriage doors in the industry. Offers the best garage door repair services in Florida. The specialists of Garage Door Repair Orange Park cover the needs of customers in Florida efficaciously. As an overhead door expert, it ensures top maintenance, repair, replacement, and installation services. Affordable Garage Doors & Openers LLC is the well-known garage door installation and repair company providing services from Atlantic Beach, St. Augustine & to Ormond Beach, FL and surrounding areas. You can read more about our garage door repair and other services, on our Homepage. Stay on this page here to know our company better and see why choosing us is the right thing to do. Why Turn to Us? Experience – We have been in the garage door industry for decades, and over the years, we have improved our skills to perfection. We now guarantee long-lasting and timely solutions to any kinds of problems. Licensed – We are licensed and fully insured in the state Florida. Free Estimates – Wondering how much any of our services will cost you? Just give us a call and ask for an estimate. We always charge what we quoted. Budget-Friendly – Whether you need a new garage door installation, just spare parts, or a full repair service, we guarantee 100% customer satisfaction at the most affordable rates. Whenever you need affordable, yet efficient, garage door repair services or are willing to buy something brand new, Affordable Garage Doors & Openers LLC is the company based in St. Augustine, FL to contact. Dial (904) 420-0371 for additional information and appointments today! Overhead Garage Doors USA is a locally owned and operated with over 20 years of industry experience. We value honesty and integrity, and stand behind our work. We specialize in garage door services. We pride ourselves on the quality of our work as well as our commitment to outstanding results. We look forward to building long-term relationships with our clients and guarantee your satisfaction! Lester's Garage Doors is a family owned and operated business, providing award winning garage door installation and repair service in Gainesville for almost 50 years. We are one of the only garage door companies holding a contractor's license. Our garage doors are superior, meeting current wind load requirements. You can call us for top-notch garage door installation of the best brands in the industry and you can also count on us to repair your existing door. Call for a FREE estimate on services for broken springs, cable replacements, keypads and anything else your door requires. Get imaginative custom-built Carriage House doors from our team, with multiple designs possible that are only limited by your imagination. Get them in cedar, Spanish cedar, PVC and more. You get quality brands from our team, including a full line of affordably priced Amarr garage doors. Founded in 1978, J.B. Mathews company offers the highest quality service, products and installation in Florida. When we opened our doors over thirty five years ago our number one priority was our customers, that priority continues today with our mission to be the most trusted sales and service provider in our market. This focus, our reputation for excellent service, and our dedicated personnel throughout the organization have helped us become one of the largest garage door dealers and service providers in the area. Burdens Overhead Doors Inc. is family owned & operated. We have been in buisness since 1992. We are here to serve you. In business for over 30 years, we are the oldest and most experienced door company in Jacksonville. All of our technicians are licensed and insured, with years of experience and knowledge. Our city license number is GD018 with the city of Jacksonville. We are the #1 door dealer in Jacksonville and we look forward to doing business with you. Call us today! Quality, Service, Selection… that’s why Overhead Door Depot is unmatched at providing the highest quality service and products to our customers, and we’ve been doing it for over 10 years! You’ll feel a higher level of comfort knowing our experienced installers and service technicians are thoroughly trained to make sure that your job is done right the first time. What kind of services do Jacksonville, FL garage door dealers and installers provide? Find garage door sellers and installers in Jacksonville, FL on Houzz. Narrow your search for Jacksonville, FL garage door sellers and installers by selecting the nearest city or zip code. Look at portfolio and product photos, and read reviews to find the best Jacksonville, FL garage door professional for your home.